Why should your baby just build with blocks when she can create a Spanish city? Make Meal Time a Learning Time! Tegu Blocks are the kind of invention that makes you think “why didn’t I come up with that?” Take a block and combine it with a magnet, and voilà! Embedded inside each block is a powerful magnet that allows you to build things that couldn’t be done with traditional blocks. To boot, Tegu blocks are made from eco-friendly wood native to Honduras, where they are manufactured. My kids love GeoPuzzles, and are always excited about a new game or puzzle from this wonderful company. GeoPuzzles makes jigsaw puzzles with pieces shaped like individual countries, so children learn as they put the puzzle together. Invented by a dad, these great puzzles are made by a a family-run business. They make Geo Cards and Games too (like Geo Bingo – which is what it sounds like!). My kids love doing art projects, and Alex Toys keeps coming out with cool new crafts to keep us busy on cold winter afternoons. This zoo kit lets kids paint bright colors on fun animal shapes and add silly accessories to create a zoo full of creative fun. The activity kit includes 6 cardboard punch-out animals, 12 poster paints, 6 crayon bright crayons, wiggly eyes, glue and easy instructions. Even better, my six year old and my almost three year old can both take part in this zoo-stravaganza. It’s tough to find activities for them to share, but big and little kids alike love zoo animals, so you can’t go wrong! For one of those 8 nights or Hannukah or a stocking stuffer: You can’t go wrong with these adorable Tea brand t-shirts that announce your child’s membership in the global kids citizens club in four languages! At Little Pim, we have just come out with an intro gift set to help you give the gift of language to little ones in your life – at a new little price! Our $29.95 intro gift set comes with the Little Pim Spanish DVD 1, Spanish Bop CD and plush panda, all in a see through vinyl tote that can later become a home for doll clothes, blocks or overnight at grandma’s supplies. 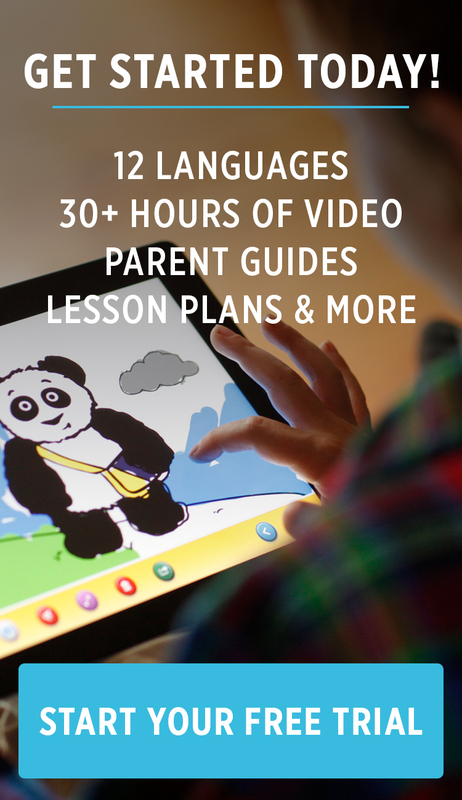 A terrific value, and provides hours of play and learning.